OLD GREEKTOWN DETROIT photo picture photography poster print for sale. This sepia tone OLD VINTAGE DETROIT GREEKTOWN photo picture print for sale is made from a professionally restored original 1952 black and white OLD GREEKTOWN HELLAS CAFE DETROIT photo picture print photography for sale. 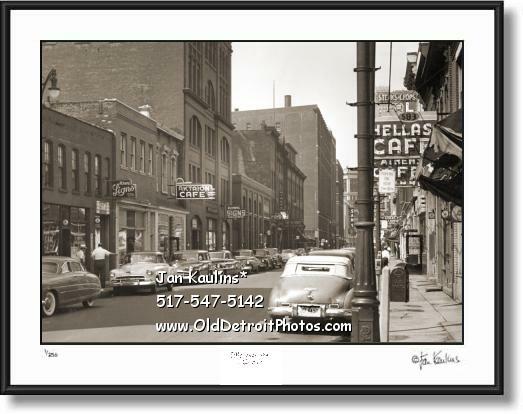 This is a wonderful vintage old DETROIT GREEKTOWN Monroe Street photo print showing a long time GREEKTOWN institution HELLAS CAFE and several other 1950's Greektown establishments. Monroe Street is filled with 1940's and 1950's vehicles. This is an excellent image of this unique Detroit Greektown neighborhood in downtown Detroit as it appeared over 60 years ago.